Wacom was one of the leader in Multi-touch industry introduce this fun tool to harness your creativity with Wacom Bamboo Fun CTE-450S, a touch tablet with 4"x5" screen that will turn your computer into canvas, allowing you to freely express yourself by simply touching the pen tip to the tablet. Touch up digital photos, draw by hand, create artwork and paintings, and even write in your own handwriting. 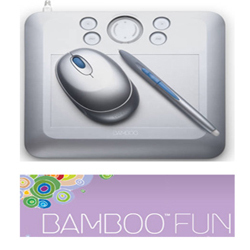 Bamboo Fun includes full editions of valuable creative software to help get your creative juices flowing. Edit photos with Adobe® Photoshop® Elements, create artwork with Corel® Painter™ Essentials, and apply photo effects with Nik® Color Efex™ Pro. Bamboo Fun is available in a variety of colors and sizes.